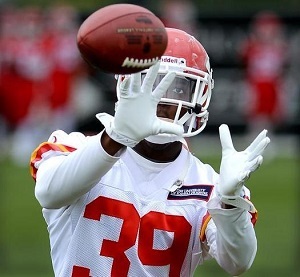 Kansas City Chiefs safety Husain Abdullah. The 41-year-old former heavyweight champion, a Muslim from Baltimore, was the marquee name in Thursday’s one-night boxing tournament showcase held in Auckland, New Zealand. But Rahman reportedly looked “laboured, lumbering and lethargic” while dropping a three-round decision to 7-1 underdog Antz Nansen of New Zealand. Nansen, who has had 35 pro fights as a kickboxer, was in only his sixth pro outing as a boxer. He improved his record to 4-2. Rahman’s record falls to 50-9-2 with 41 knockouts. Kali Meehan of New Zealand, 44, won the Super 8 tournament with a first-round knockout of Michael Sprott in the final. The last time you saw Husain Abdullah on the football field, he intercepted Andrew Luck twice in Kansas City’s wild-card playoff game against Indianapolis — but Abdullah was also part of a Chiefs defense that allowed 45 points to the Colts in a game Kansas City gave away in the second half. The Chiefs still liked Abdullah enough to re-sign him in the offseason to a two-year deal, and he has reportedly looked good in recent practices. Says QB Alex Smith: “He’s smart. He sniffs out what we’re doing and he’s able to get a beat on it. You can’t be late; otherwise he’s going to make the play. That’s really what I see and I think mentally he does such a good job of recognizing and diagnosing what we’re doing.” Pro Bowl safety Eric Berry also had some favorable comments for Abdullah, who was back in the league last season after missing all of 2012 by choice to perform the Hajj pilgrimage in Mecca and tour masjids around the U.S. with his brother, former NFL safety Hamza Abdullah. Outside of the Landon Donovan controversy in the U.S., perhaps the biggest surprise of the recent World Cup roster announcements was France leaving 23-year-old rising Muslim star Samir Nasri off its roster. When reports began surfacing that 31-year-old established Muslim star Franck Ribery might have to miss the World Cup due to a back injury, some thought Nasri would be the natural replacement. But even if Ribery can’t play, Nasri reportedly won’t be invited to take his place.